Around the Blogosphere: Who’s Got their Blogging Cap On? 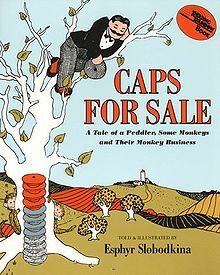 Anyone remember the book Caps for Sale? One of my all-time favorites. I’m trying to remember back to when I was a kid, but I think I related to both the monkeys (I mean, how could you resist?) and to the peddler (SO frustrating!). And I do remember thinking…All those caps! On ONE head! Well, this month, I’m mostly relating to the peddlar. Not with the frustration, but with all those caps! With high school starting, I’ve been wearing my mom cap a lot (although very subtly and sneakily, I assure you). I’ve been doing more critiquing for clients–so there’s an editor cap. Got the house tidy for my parents’ visit–that’s a housekeeping and daughter cap. Baking cap goes on later today to make my husband’s birthday cake. And I’m prepping for the Central Coast Writers Conference next week–look at that sparkly speaker hat. I’m having fun with all of it, but I seem to have misplaced my blogger cap for a bit. *Checks behind computer–nope* So…I’m going to look around the blogs & share what some other cap-wearers are up to! If you’re even thinking about writing historical fiction, or if you like reading it, don’t miss this post by Jeannine Atkins about Tracy Chevalier’s new book, Remarkable Creatures, a novel about Mary Anning. Jeannine is the author of the picture book Mary Anning and the Sea Dragon, and she does a lovely analysis of the different choices she and Chevalier made about how to deal with the unknowns of Anning’s life. Kate Messner guest posts at lesleysays about how to find time to write. Kate’s success in the last couple of years is proof that she does exactly what she’s talking about–she makes it happen. I love the idea of a treadmill desk, and here’s Helene Boudreau’s post, with video, about how to make your own. Emma Dryden posted some thoughts about verse novels on Facebook, inspired by questions from Susan Taylor Brown. I love this: “A verse novel is – and should be – first and foremost a novel, with a compelling storyline and plot, richly developed characters, and a distinctive narrative voice.” Oh, yeah. Enjoy your week. And I’ll keep looking for the monkey who stole that blog cap. Great post. Wish I could see you wearing your sparkly speaker cap!